Ideal for ultra sensitive skin or extreme sun conditions, the Ultrasun 50+ SPF Extreme protects skin from harmful UVA and UVB rays. 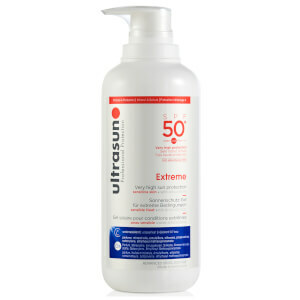 The water resistant lotion absorbs quickly into skin without making it sticky or greasy and is enriched with pro vitamin B5 to lock in moisture. Antioxidant vitamin E shields skin from free radical damage to leave skin healthy-looking and supple. The handy pump bottle offers mess-free application and prevents wasting the product. E.N. No perfume, mineral oils, emulsifiers or preservatives are contained.